Dr. Jay McDonald did his medical school at the Wayne State University and served his internship at the Oregon Health and Science University. 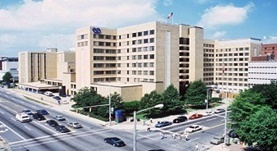 He completed multiple residencies at Detroit Receiving Hospital, University Health Center, and Barnes-Jewish Hospital, Washington University. He is a board certified pathologist, currently practicing at the Birmingham VA Medical Center. Dr. Jay has also contributed to three research publications during his career. Dr. Jay McDonald has contributed to 3 publications. Characterization of Calmodulin-Fas Death Domain Interaction: An Integrated Experimental and Computational Study. Fancy, R. M.,Wang, L.,Napier, T.,Lin, J.,Jing, G.,Lucius, A. L.,McDonald, J. M.,Zhou, T.,Song, Y.; Biochemistry. 2014 Apr 08. PARP-1 Regulates Resistance of Pancreatic Cancer to TRAIL Therapy. Yuan, K.,Sun, Y.,Zhou, T.,McDonald, J.,Chen, Y.; Clin. Cancer Res.. 2013 Sep 1. Yan, Q., McDonald, J. M., Zhou, T., Song, Y.; Proteins. 2013 Mar.